Peel the pineapple and remove the core. Peel the kiwis, the papaya and the mango. Cut all the fruit into small cubes. Cut the passion fruits in half and then scrape out the juice and seeds. Place the fruit in a bowl then add the passion fruit juice and seeds. Mix well without bruising the fruit. For the champagne emulsion: place the gelatine leaves in a bowl of cold water to soften. Place the sugar and water in a saucepan and bring to the boil. Add the softened gelatine leaves to the sugar syrup and mix well to dissolve. Add the milk and the champagne to the pan and then pour the liquid into a syphon. Chill in the fridge. Cut the puff pastry into rectangles and then brush with egg yolk. Sprinkle the dessicated coconut and icing sugar over the pastry and then rest in the fridge for 10 minutes. Remove from the fridge and twist each piece of pastry to make your twists. Transfer to the oven and bake for 20 minutes. 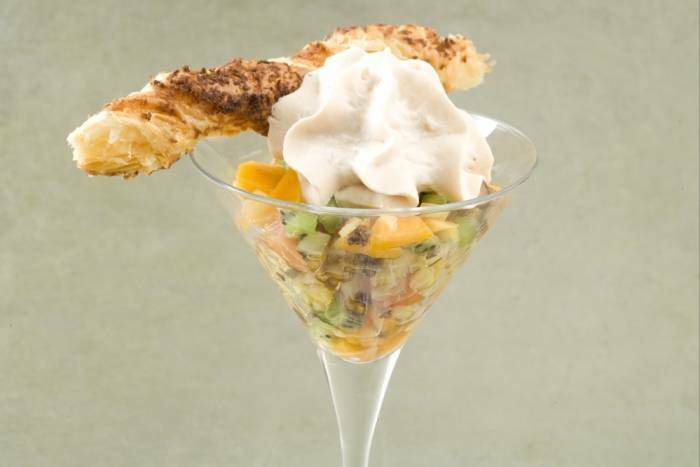 Serve the tropical fruit salad in glasses, top with the champagne emulsion and finish with a coconut twist.